I think I might be becoming semi-obsessive with my tomato plants and their well being. This all started with my oldest insistent that we plant heirlooms this year. I agreed, it would be fun. Fun, hmmm. It has been fun, it also can drive a person crazy. See I tend to lean towards slightly overboard with most projects. I like things to be perfect and right. My son was at my in-laws for the last two weeks so I was excited that his tomatoes would be almost ripe by the time he got back. Then we had a nasty streak of hot and humid weather. I watered the tomatoes like I always do, but one of the plants just wasn't happy. After reading information online, a call to an extension agent and many conversations with friends that grow tomatoes I'm happy to say that his tomatoes are beautiful once again. As for me I think the tomatoes are becoming like another pet, a lot of work with an occasional reward. I hope it will be worth it the end, tomatoes and summer just seem to go hand in hand. This week to welcome my oldest back home I made comfort food. I tried a new recipe for Baked Ziti from the Food Network. This recipe has 7 ingredients in the ziti and 9 ingredients in the sauce. It takes 50 minutes of total time, 20 minutes of which is active and makes 6 to 8 servings. I did make a few changes to the original recipe. First I used leftover frozen rigatoni pasta that I had made previously. I allowed it to defrost and then followed the rest of the recipe. Instead of Italian sausage I used ground roast chuck that I ground myself. I substituted the exact same amounts as in the original recipe. Since ground beef can be more watery than Italian sausage I allowed the sauce to cook down longer until it was nice and thick. After I put the baked ziti together in a casserole dish I allowed it to sit in the fridge for 4 hours to allow the flavors to soak into the pasta. I served this recipe when my in-laws were over for dinner. Since I couldn't try the recipe myself I relied on everyone else to voice their opinions. My youngest son fell in love with this dish and told me it was his favorite pasta dish. The opinions expressed by my in-laws were similar. Overall, it was a nice way to use leftover pasta and a recipe I would make again. For the recipe go to Baked Ziti. Hi This looks like a great way to use pasta and other things as well. I like to use left over pasta in a bake with veggies, a tomato sauce or a spicy one. That's a really good idea. Whenever I make a baked ziti, I always cook up fresh pasta. I never thought to re-use it like that. I love recipes that use leftovers well... I hate to waste anything. I'm the same way, I try to reuse every last bit! I love the muffin tin idea, my kids would think that they were perfect sized! Thanks for the pin :) I love pasta too! Its really worth to try.. It's very easy and the flavors are great together! Mmm, the ultimate comfort food! We had some leftover pasta last week, this would've been perfect. Baked pasta is a great comfort food, I agree! Great idea! I come from a family where just about all the men HATE leftovers. They're not always my favorite, but I hate wasting food. I need to find more ways like this to make leftovers into new food. Baked Ziti is high on my list of favorite comfort foods. It's pretty high on my list too! i love baked ziti. we have spaghetti at least one every two weeks, and the days following are always some kind of baked dish using the leftovers! We love pasta...especially when its all baked together and gooey! That looks delicious! I love dishes you can make ahead of time and that reheat well. Will give it a try! I'm working on it :) I started last night, but it will take me a while to made sure everything has a label so I can put it into categories. Hopefully it will be done by the end of the weekend! 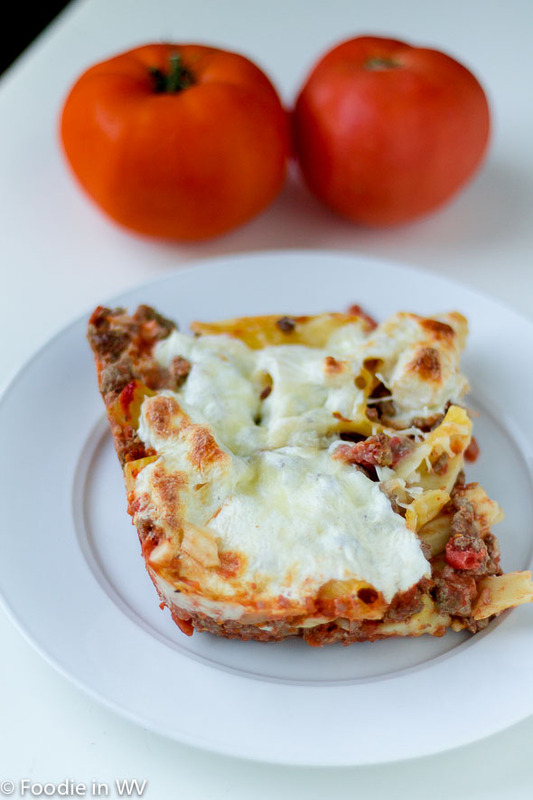 Love baked ziti and this is a good idea. Time saving which is key. Baked ziti is yummy I agree!